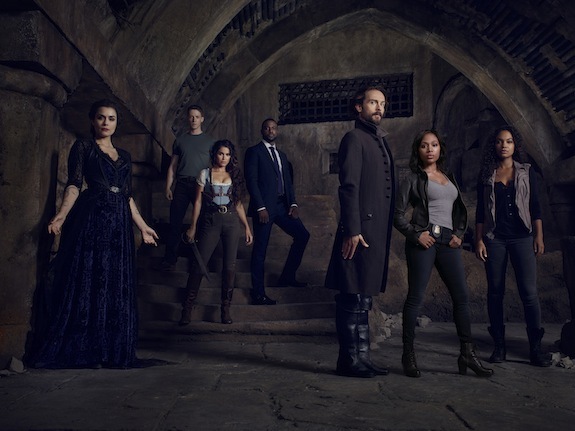 The SLEEPY HOLLOW cast has undergone a bit of change over the past few months — John Noble’s Henry and Katia Winter’s Katrina were killed off in the final episodes of the show’s second season, while Orlando Jones (Irving) exited the series over the hiatus. To fill the void, a few new faces have joined the Fox series: Nikki Reed (who is playing Betsy Ross), Shannyn Sossamon (who is playing Pandora), Lance Gross (who is playing Abbie’s boss, Daniel Reynolds), and season 2 guest star Zach Appelman, (who played Corbin’s son, Joe) are all now regulars on the drama. SLEEPY HOLLOW season 3 premieres Thursday, October 1st at 9 PM on Fox. SLEEPY HOLLOW has made Lance Gross and Zach Appelman series regulars, a rep for the show has confirmed. Gross will make his first appearance in the upcoming third season as Daniel Reynolds, Abbie’s new boss. Appelman appeared in a season 2 episode as Joe Corbin, the son of Abbie’s (deceased) former mentor/partner, Sheriff Corbin. Gross and Appelman join fellow new season 3 regulars Nikki Reed (who is playing Betsy Ross) and Shannyn Sossamon (who is playing Pandora). They join returning series regulars Tom Mison (Ichabod), Nicole Beharie (Abbie), and Lyndie Greenwood (Jenny). The Hollywood Reporter was first to reveal the promotions.